This was the Gegard Mousasi UFC fans were waiting for. A little over a year after his Octagon debut, the international star showed Saturday at the O2 World Arena in Berlin why he has long been one of the best fighters in the game, showing off a complete mixed martial arts attack before submitting Mark Munoz in the first round. 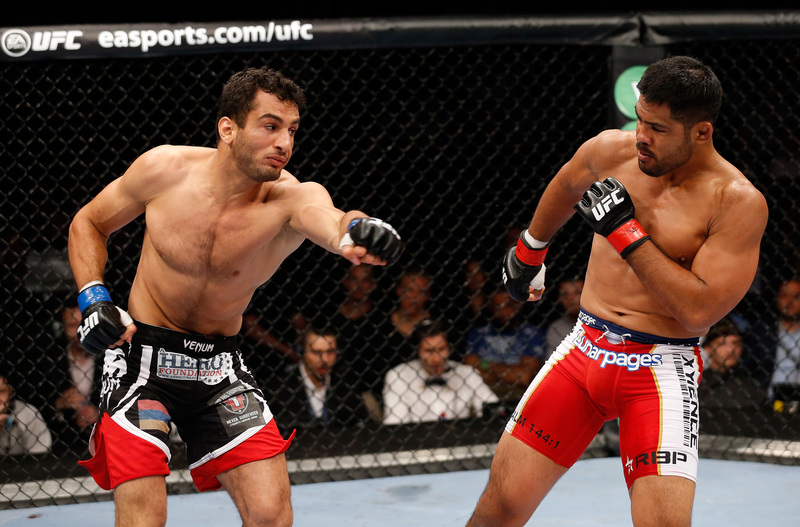 “Whoever will get me closer to getting a title shot, I’m ready,” said Mousasi, now 35-4-2. In his previous two UFC bouts, he decisioned Ilir Latifi and lost a Fight of the Night decision to Lyoto Machida. But this was the performance he’s long wanted to deliver in the promotion. Munoz threatened with takedowns immediately, Mousasi responding by keeping a low base. Munoz did get a slam off, but the Netherlands product bounced up immediately, eager to get his stand-up game in gear. Mousasi defended Munoz’ next takedown attempt well, even threatening a choke before landing in the top position on the mat. The former Strikeforce champion subsequently went on to punish Munoz at every turn, eventually sinking in a rear naked choke that produced a tap out at 3:57 of the first round. With the loss, the 36-year-old Munoz falls to 13-5. The resurgence of middleweight CB Dollaway continued, as he won his fourth bout in his last five outings, taking a gritty three-round unanimous decision over top ten contender Francis Carmont. Scores were 30-27 twice and 29-28. Carmont fought well from long-range early, keeping Dollaway at bay with hard kicks to the legs and body, and countering with punches as “The Doberman” got close. Midway through the round though, Dollaway hit the mark, dropping Carmont with a left hook. Dollaway poured it on in an attempt to finish, but Carmont recovered and raised his hands to the crowd, drawing a roar from the German fans. With a minute left, the Carmont turned the tables with a takedown, yet it was Dollaway reversing position just before the end of the frame. Both bloodied by the first round action, Carmont and Dollaway absorbed the cheers of the crowd as the second stanza began, and they resumed their battle as soon as they were called to fight, with the Frenchman scoring well with his kicks until Dollaway took him down near the midway point. Carmont got to his feet before any damage could be done, working a kimura as the two went back to the mat. 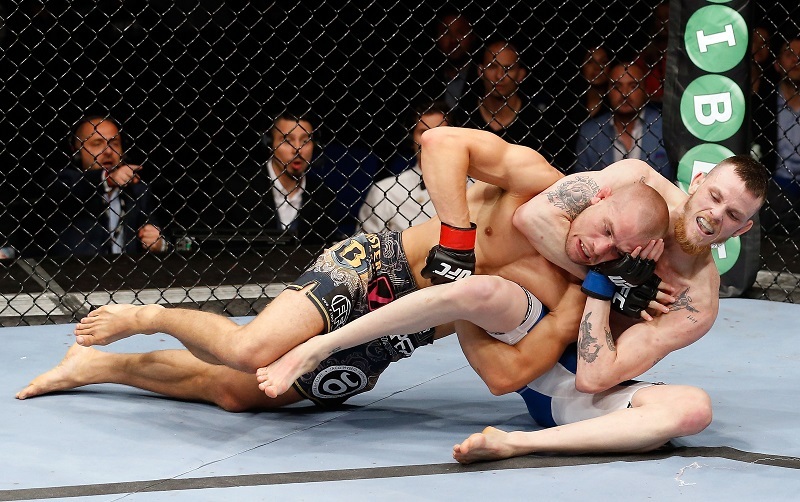 Dollaway escaped with little difficulty, keeping the top position before taking the back late in the round. Despite breathing heavily, a development perhaps related to his bloodied nose, Carmont kept the heat on with his kicks as the final round commenced, but it was Dollaway using his wrestling prowess to put the fight on the ground again. There, the Arizonan kept control until Carmont made it to his feet with a little over two minutes left in the fight. 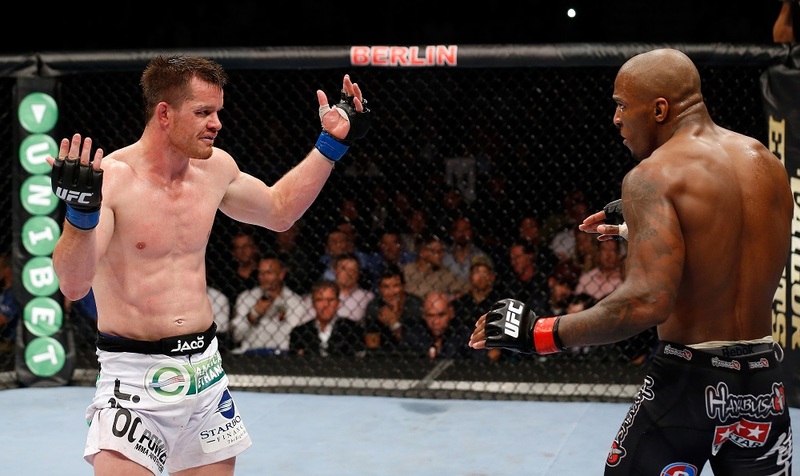 But Dollaway’s wrestling was relentless, and that proved to be the difference in the fight. With the win, Dollaway ups his record to 16-6; Carmont falls to 22-9. It wasn’t the barnburner many expected, but in a clash of unbeaten middleweight prospects, Sean Strickland kept his “0,” scoring an unpopular three-round split decision over England’s Luke Barnatt. Scores were 30-27, 29-28, and 28-29 for Strickland, now 15-0. Barnatt falls to 8-1. The two got acquainted with each other carefully in the first round, Barnatt jabbing with his fists and feet as he moved forward, Strickland countering in response and getting busier as the round progressed. After the fans booed the lack of action in the opening frame, things heated up in the second, with Strickland scoring his first takedown of the fight and getting in some ground strikes. Barnatt got back to his feet quickly and tried to pressure Strickland more than he had earlier. Strickland wasn’t going to get drawn into a brawl though, even after getting drilled with a hard right from the Brit. A second right moments later definitely got Strickland’s attention, prompting him to lock up with his foe, but Barnatt shook him off and got back down to business, landing two more hard rights before the bell. The third round saw Barnatt keep stalking, with Strickland not putting together any consistent offense against the former Ultimate Fighter cast member. When he did stop moving to plant and feet and throw, the Californian had some success, apparently making an impact with the judges as well. With less than two minutes left, the bout strayed to the mat, with Strickland looking for a leg lock, but he came up empty, the two standing seconds later. From there, the pattern of the fight continued, with Strickland pointing to an injured right hand as the final horn sounded. Late-notice replacement Niklas Backstrom made the most of his UFC debut, submitting Tom Niinimaki in the first round of their featherweight bout. The veteran Niinimaki was able to put the lanky Swede on the canvas in the first minute of the bout, and even with Backstrom getting back to his feet, “Stoneface” kept him locked up until he scored another takedown. Backstrom kept battling, even as the two stood, and a jumping guillotine gave Niinimaki plenty of notice that he was still in a fight. But not for long, as a hard knee followed by a rear naked choke stunned the crowd and forced Niinimaki to tap out at the 4:15 mark. With the win, Stockholm’s Backstrom, who replaced Thiago Tavares in the bout, improves to 8-0 with 1 NC; Niinimaki, who saw a 12-fight winning streak snapped, falls to 21-6-1.